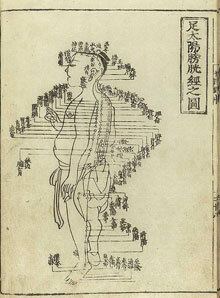 Acupuncture originated in China over five millennia ago. It is based on the belief that good health is determined by a balanced flow of qi, the vital life energy present in all living organisms. According to acupuncture theory, qi circulates in the body along fourteen major energy pathways, called meridians, each connected to specific internal organs and their systems. There are over one thousand acupuncture points within the meridians system that can be stimulated to promote the flow of qi. As acupuncture needles are inserted into these points on the human body. They help to correct and rebalance the flow of energy and consequently restore health. Each year, people in the U.S. make some 9 to 12 million visits to acupuncturists for treatments as diverse as arthritis, bladder infections, back pain, and morning sickness. In Washington State, acupuncture has been a recognized profession by the Department of Health since 1987. The World Health Organization of the United Nations (WHO) has quoted 104 different conditions that acupuncture can treat, including migraines, sinusitis, the common cold, tonsillitis, asthma, inflammation of the eyes, myopia, addictions, duodenal ulcer and other gastrointestinal disorders, trigeminal neuralgia, Meniere’s disease, tennis elbow, paralysis from stroke, speech aphasia (loss of language abilities due to brain damage), sciatica, and osteoarthritis. Acupuncture has also been found to be effective in the treatment of a variety of rheumatoid conditions, and brings relief in 80 percent of those who suffer from arthritis. There is also evidence to suggest that acupuncture is valuable in the treatment of environmentally-induced illness due to radiation, environmentally toxic compounds, and air pollution. Statement by the World Health Organization: “The effectiveness of acupuncture analgesia has already been established in controlled clinical studies. Acupuncture analgesia works better than a placebo for most kinds of pain, and its effective rate in the treatment of chronic pain is comparable with that of morphine.